1. Land area for 1GW Wind Farm, Nuclear station, or Solar Farm. 2. UK MAGNOX & AGR reactor cores. Lithuania: Huge 1500MW RBMK reactor cutaway. (3) Lithuania: Chernobyl type RBMK reactors. (4) Canadian CANDU Heavy water cooled reactors. Winfrith Dragon EU test reactor for high temperature fuels. 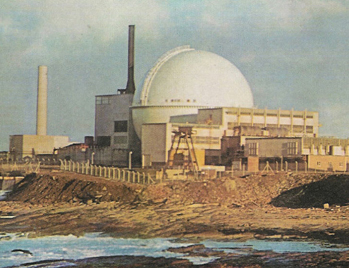 (5) Dounreay Fast Reactor to close fuel cycles. Dragon High Temperature test reactor. (6) Wetsinghouse-Toshiba AP1000 Passive Safety. Large EPR catcher for small core. (7) AREVA EPR PWR reactor cutaway. GE-Hitachi Economic Simplified BWR. No pumps. Passive safety. Mini Primer on Nuclear Reactors. (1) Let us take a short historical tour through the why and how of the many reactor designs as displayed in the mini gallery on the left. Nuclear power has a tiny impact on land use compared with Wind and Solar plants. Great improvements in efficiency and safety have been achieved by the current Generation III reactors. Generation IV/V will finally meet the requirements for millennia of fail-safe clean nuclear energy. Steady improvements in the management of US reactors have enabled them to run at a 95% duty factor for base load electricity. French reactors supply 70% of electricity so the fleet also has to respond to daily variations in demand. Nuclear reactors have proved themselves safe when all the rules and procedures are followed. The three major reactor accidents at Three Mile Island, Chernobyl, and Fukushima were all due to human failings. By identifying how these failures led to disasters one can engineer more possibilities out. Ideally, any equipment or control failure should simply lead to an automatic cold shutdown of the reactor with no consequences which cannot be repaired and no radiation leaks to the environment. The next range of designs meets these goals. Good training and management have been sufficient for the current US fleet of reactors. Reactors can do more than just make electricity: They can breed Tritium fusion fuel, produce Hydrogen for transport and liquid fuel processing, produce medical isotopes and irradiate and test advanced materials. Some of these options are described in the Reactors Library. 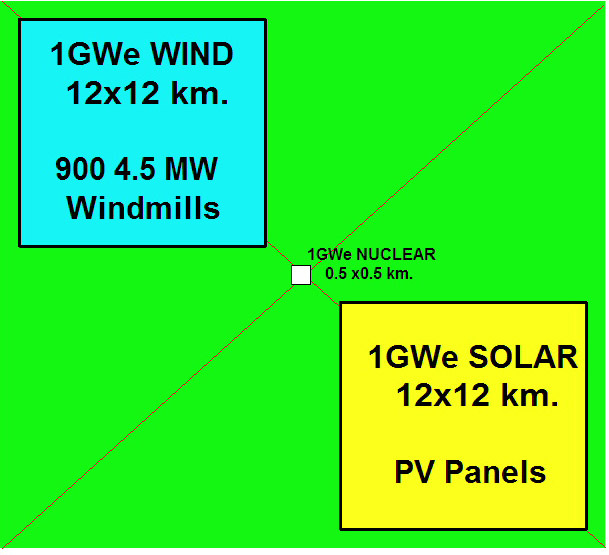 To begin with, we compare the land use of a 1GW power plant based on wind, unclear, and solar generation (1). It is normal practice to put 2-6 reactors on a site which concentrates expertise and services and reduces the number of high power grid lines required. The early non-US reactors used natural Uranium duel, avoiding the huge costs of enrichment diffusion plants. With only 0.7% of the fuel being fissile, every neutron released was very precious. The UK MAGNOX design used a large matrix of graphite blocks with channels for fuel rods and gas cooling by Carbon Dioxide. Carbon has a very low capture cross section for neutrons. 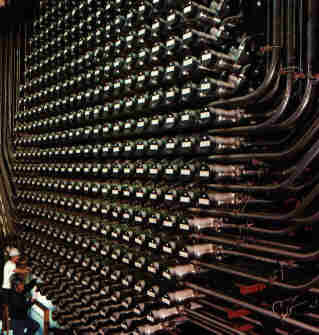 The reactors are large to reduce leakage of neutrons from the core. The MAGNOX reactors served well for 40 years but had a fairly low burn-up. The Magnesium alloy fuel cladding was unsuitable for long term storeage so the fuel had to be recycled and the Plutonium extracted. This has left the UK with the largest stocks of civilian Plutonium in the world - about 100 tonnes. The Russian RBMK design resulted in the world's largest reactors at 1500MW output. The graphite core was cooled by water at high pressure in steel tubes through the core. Many of these were built including the one at Chernobyl and the one pictured here in Lithuania. Russia was warned that the reactor could be unstable, going to melt down in a few seconds in certain conditions. The lack of an outside containment dome meant that an accident would be catastrophic - as it was. Even worse, the quality of the graphite left it with enough impurities to allow it to catch fire. Modern nuclear graphite will not burn below 2000C. It was a condition for joining the EU that Lithuania close its 2 RBMKs, supplying 70% of its electricity. This was not strictly necessary but aid was expected to replace them with new models. This has not yet happened. Russia continues to run its own RBMK reactors safely. They will be replaced by their VVER PWR reactors at the end of their service lives. 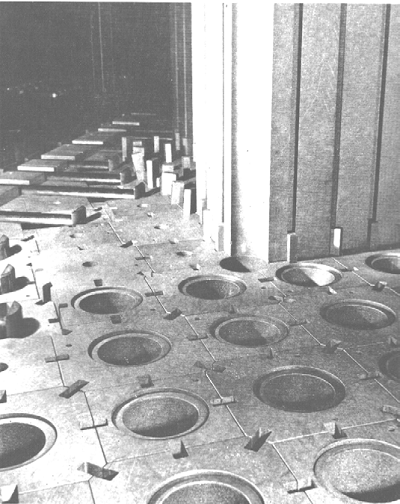 The Canadian CANDU reactor used heavy water ( D2-O) in high pressure steel tubes as the coolant because Deuterium has a very tiny cross section for neutron capture, unlike the Hydrogen in H2-O. 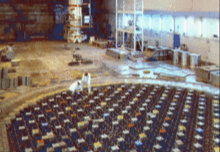 The reactor is built on its side and can be refuelled while the reactor is operating. Canada sold these reactors in many countries but only by offering huge subsidies for long term loans. The reactors are safe in a loss of cooling accident due to their large thermal mass which prevents a melt down. However, fracture of a steel cooling tube could cause a steam explosion which may disable the reactor. This has never happened, but secondary containment would prevent radiation releases to the environment. Uranium seemed quite rare on the planet so it was thought to be essential that the non-fissile U-238, 99.3% of the fuel, should be irradiated for conversion to Plutonium fuel, Pu-239. The absorption cross section for thermal neutrons is too low for this to replace all the fuel burned. The cross sections are much higher for hot neutrons. A fast neutron spectrum can be achieved if the power density is much higher and the fuel enriched to about 20%. Such Fast Reactors could breed more Pu fuel than the Uranium burned, but only by 2-10%. The UK Dounreay Experimental Fast Reactor tested many variations of fuel composition and coolants, seeking the maximum breeding ratio. The Dounreay machine could be very dangerous if cooling pumps had failed. Other Fast reactors were built in the US, Russia and Japan. Russia has the longest running and successful power reactors in service. Later designs have addressed the loss of cooling accident more carefully. The workhorse reactors on the planet are mostly PWRs, using fuel enriched to 3-5% for higher burn up. The fuel is clad in Zircalloy, which absorbs few neutrons, and is cooled by light water (H2-O). The big problem is that the earlier models would melt down if cooling failed. The Zircalloy can burn in air and steam, releasing explosive Hydrogen gas, though this is removed at low concentrations by Hydrogen burners. This only happened once, at Three Mile Island, due to comprehensive failure by all parties involved. No significant radiation was released and nobody was injured. The operators lost a valuable reactor and, due to panic by Jimmy Carter, the US gained a freeze on nuclear development. The new Generation III PWRs by Westinghouse and Areva tackle the problem in different ways. The Westinghouse AP1000 design uses gravity and natural circulation to fool the reactor in the absence of pumping. This is called Passive Safety. 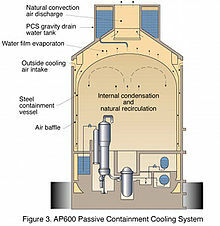 Passive Hydrogen burners eliminate the sort of explosions seen at Fukushima. The Areva EPR use four way cooling systems with multiple power backups to eliminate the TMI type failure. The only dangers which cannot be engineered out are from the staff, so the design includes a 'core catcher' to prevent molten fuel from escaping the building. This is a management and security issue. All reactors are now built with concrete domes which can contain any radiation escaping from a reactor and protect the plant from external attacks by terrorists or an airliner crash. 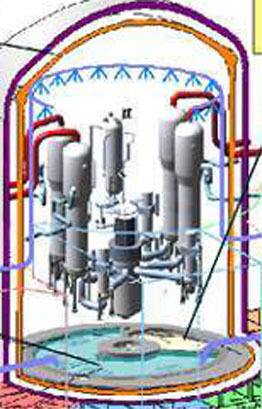 Boiling water reactors run at low pressure but sufficient to keep the cooling water in a liquid state. GE considered their original designs so safe that an outer concrete dome was unnecessary. The Fukushima accident showed this was not so, and three GE reactors suffered melt down. The safety systems and electricity back up systems at other GE sites around the world were upgraded over the last few years. Sweden installed passive, catalytic Hydrogen burners in place of the powered burners specified by GE. Had this been done by TEPCO or enforced by the regulators or by GE, the Hydrogen explosions at Fukushima which turned meltdowns into a widespread release of radiation would not have happened. The Three Mile Island management mistakes were repeated. A year on and the radiation levels over most of Fukushima Province are below international safety levels but above the extremely low, fantasy levels set by the Japanese government. Safety improvements have been made at other Japanese reactor sites and a restart of their nuclear power seems not far away. The newest GE BWR is an entirely different concept. The reactor is much larger, with a 1500-1600 MWe output, but this allows the coolant to circulate entirely by natural convection. No coolant pumps are needed and the reactors is passively cooled by additional water supplies on shutdown. There will be no more Fukushimas from GE. A nice history of the ESBWR by Mark Williams is in the Library. The Generation III evolution of nuclear reactors are vividly different, offering massive base load output and complete safety for the region in which they operate. In other Generation III developments, much smaller reactors, with outputs of 100-300 MWe, have also been built, the SMRs. Their electricity is more costly but the initial capital requirements are much smaller. They are also suitable for the many places where a huge base load reactor is unnecessary. The story is not complete. These thermal reactors have moderate burn up, only 35-39% thermal efficiency, and do not close the fuel cycle or breed enough fresh fuel from natural Uranium. 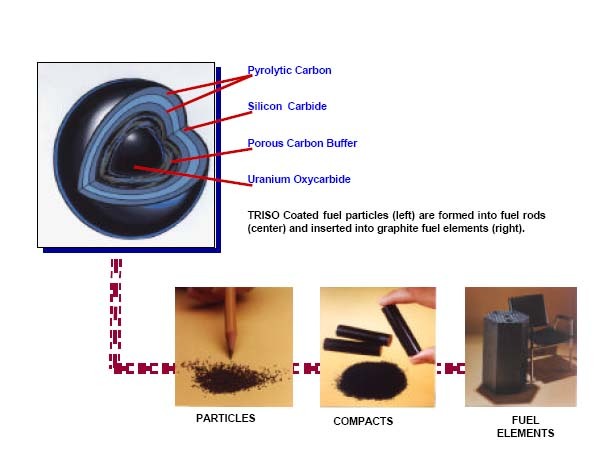 The TRISO pellet fuelled designs by General Atomics are still thermal neutron reactors but with far higher burn up. This meets the breeding and waste burning needs and can work with many different fuels. The massive graphite cores allowed for passive cooling safety without melt down or reactor damage if the Helium coolant was lost. They are to run at very high temperatures, in excess of 800 degrees, which can lift the efficiency of energy conversion to electricity to 45% or more. The US NRC has not certified the designs, partly for their lack of expertise in the technologies.This whole story is in mothballs at present. Fast Reactors have long been seen as the answer. However, the early designs for sodium cooled fast reactors were not really safe enough. 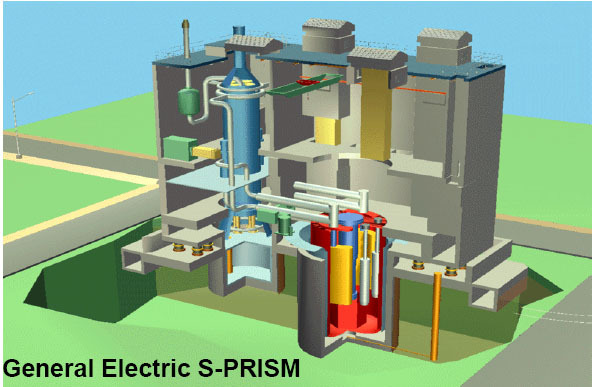 GE have applied their knowledge of passive safety from natural circulation to Fast Reactor design in the GE S-PRISM . This is ready for full certification and licensing from the NRC. GE has proposed an S-PRISM to the UK as a way to burn up their Plutonium stockpile.This is the wrong goal. This high quality fuel, produced by recycling spent Magnox Fuel, should be used to start as many S-PRISMs as possible. These would be partnered with a full scale Pyro-Processing plant to recycle the spent fuel, using UK Depleted Uranium as breeding feedstock to run for centuries. Technical details of the S-PRISM design and the PyroProcessing technology are in the library - Fast Reactors. There is an S-PRISM model with Depleted Uranium blankets at the top and bottom of the reactor. It could reach a breeding ratio of 1.2, yielding enough to help refuel PWR reactors with MOX. Some of the Pu stockpile could also be used to start up Thorium Molten Salt reactors or to breed fresh Plutonium from Depleted Uranium or as part of a blanket in a Fusion Hybrid. There is not the slightest urgency in using the Pu stockpile, but it is a high quality fuel source, unsuitable for weapons manufacture. The S-PRISM is proposed in the USA as a means of burning all the legacy spent fuel from the US Light Water reactor programme. It requires Pyro-processing to maintain the flow but, again, has the wrong goal which should be to fire up the largest possible fleet of Fast Breeder reactors. Perhaps Spent Politicians can be recycled? These are the more advanced Fast reactors, Thorium Molten Salt breeders and Fusion-Fission Hybrids, discussed elsewhere on this website. The goal is to run the planet on these systems for tens of thousands of years. This assumes that the human race will survive its many follies over that period. The most important waste for nuclear power is the average 30% of energy discarded or lost by users. Renewable energy systems need Smart Grids to suppress demand when they cannot meet it. Nuclear power probably needs the same to overcome the human folly of simply wasting it all the time. The 10000 reactor scenario for 2100 needs this to provide most citizens with adequate supplies. GE S-PRISM. No NRC Licence.